Pupils at seven schools could have shorter days after a trust head say he may have to cut hours to save money. Dave Baker, of the Olympus Trust which operates near Bristol, said government cuts had left it at "crisis point". Parents described the funding problem as "diabolical". A union said the idea was "terrible" but families deserved to know the truth about funding. A Department for Education (DfE) spokesman said new funding plans would increase the trust's budget by 2.4%. The Olympus Trust runs one secondary, one all-through school and five primary academies in South Gloucestershire, to the north of Bristol. In the letter Mr Baker warned parents of the "unthinkable" decisions the trust could be forced to make from September. These include shortening the school day "because we cannot afford to staff lessons for the whole week". Other proposals are cutting teaching and support jobs within the schools, increasing class sizes and reducing the curriculum. The letter also says parents may be asked to make regular financial contributions to supplement school funding. Mr Baker said South Gloucestershire was one of the five worst-funded local authorities so had less reserves to draw upon. Beckie Morton, a parent of two daughters at Charlborough Road Primary School, is anxious about the impact any cuts will have on her girls, aged 10 and seven. She said: "It's shocking - I don't know what I'd do work-wise if they shortened the school day. Image caption Kevin Courtney said the trust's suggestions were "terrible" but "understandable"
"If they do this, all that will be left is the lessons and no extra support for pupils. "My eldest daughter suffers panic attacks and has received a lot of pastoral care - this will have a massive impact on her final year there." 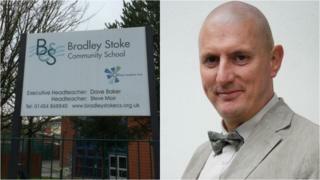 Natalie, who has a son attending at Bradley Stoke Community School, called the proposals "diabolical". She said: "At the moment we are hoping to have a special needs support worker for my son and if they cut funding he won't have that. "I don't blame the school, they are trying their best." In December, the government announced the biggest shake-up of school funding for decades. The DfE said the current system was "unfair, opaque and outdated" and the changes would see more than half of England's schools get more cash. "We recognise that schools are facing cost pressures, which is why we will continue to provide support to help them use their funding in cost-effective ways, including improving the way they buy goods and services, so‎ they get the best possible value. " Kevin Courtney, chair of the National Union of Teachers (NUT), said schools were still facing an 8% reduction in spending power. He said: "All schools in England will have less money in real terms per pupil in 2020 than they do now. "This cash they talk about doesn't keep pace with spending pressures on schools. "The proposals Mr Baker has mentioned are terrible and none of them should happen, but parents deserve to know the truth about the position schools are in." The consultation on the new formula runs until 22 March 2017.